The Ministry of Labour, Invalids and Social Affairs (MoLISA) received 1,000 wheelchairs for war invalids and the disabled from IM Japan – a Japanese international human resources training agency, on January 19. Addressing the event, MoLISA Minister Dao Ngoc Dung lauded the contributions of the IM Japan in Vietnam, especially to Vietnam-Japan labour cooperation, adding that the ministry will promptly deliver the wheelchairs to people in need. Chairman of the IM Japan Yanagisawa Kyoei expressed his hope that the gifts will help the disabled integrate better into society. 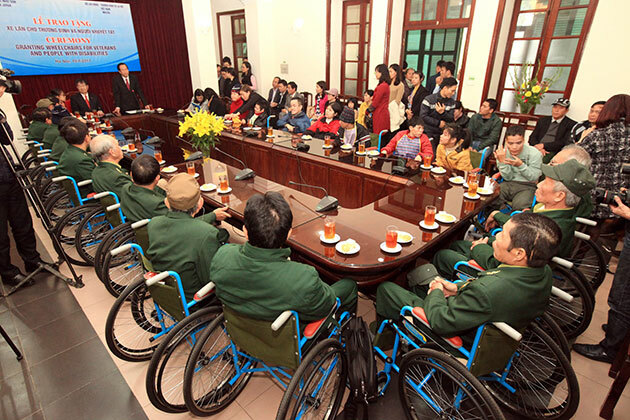 On the occasion, MoLISA handed out 200 wheelchairs to people of Thai Binh and Thanh Hoa provinces./.